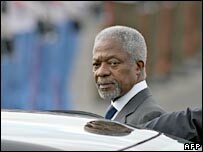 Behind the scenes at the UN General Assembly under way in New York, the manoeuvring over who will succeed Kofi Annan as secretary general at the end of this year is intensifying. We look at the process to replace the world's top diplomat. Who chooses the Secretary General? He or she is elected by the 192-member General Assembly - but on the recommendation of the Security Council. The process involves unwritten rituals and traditions and has led many diplomats to describe it as opaque and baffling. According to tradition, a candidate emerges from discussions, wrangling and a series of informal "straw polls" held by the Security Council. But, the five permanent members of the council - the US, Britain, France, Russia and China - have in effect a veto over the selection. Member governments nominate candidates. Up until now, these candidates have not really campaigned for the job so they have been judged more on their nationality than on their agendas. This time round, however, there has been campaigning of sorts by nominees. They have spoken at various UN forums to secure support for the job. How does the voting happen? 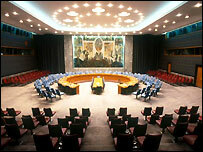 Members of the Security Council hold a series of informal "straw polls" in the months before they recommend a candidate to the General Assembly. This involves filling in ballot sheets with the following choices: "encourage," "discourage," "no opinion." Candidates are only told how many positive or negative votes they get, but the polls are very difficult to read. Members may switch their vote and a candidate who emerges as a favourite after one poll may lose his or her position after the next. At this point, the results do not distinguish between the votes of permanent veto-bearing members and non-permanent members of the council. Eventually, the council will take a vote that will indicate which candidate is backed or opposed by any of the permanent members. During this poll, coloured ballots are used to distinguish between the Permanent Five and the others. The person with the most votes and no veto will be recommended to the assembly. Traditionally, the General Assembly has accepted the recommendation. Council members have said they would like the successor chosen by the end of October. In 1996, the arguments went on until mid-December and Mr Annan was only chosen a few weeks before taking office. How long does the secretary general remain in the post? The post is subject to a five-year term, and the secretary general can serve a maximum of two terms. The only secretary general who did not get a second term was the Egyptian Boutros Boutros Ghali. The Clinton administration vetoed the second term after Mr Boutros Ghali fell out with the Americans over a range of issues from Bosnia and Rwanda to the non-payment of US dues to the UN. Why is there speculation that the next UN head will come from Asia? There is a tradition that the post rotates by region, and Asia has not had a secretary general since Burma's U Thant completed his second term in 1971. So it has been generally accepted that it is Asia's turn this time. This has led to criticism about the system of regional rotation. John Bolton, the US ambassador to the UN stated publicly that the job should go to the best-qualified person, regardless of what part of the world they come from. One of the candidates, Latvia's President Vaira Vike-Freiberga, has also argued that more transparency is needed in the selection process. There has never been a female secretary general. Who is running for the job? Ashraf Ghani, a former finance minister in the Afghan government, who has worked as an adviser to the United Nations and on World Bank projects in China, India and Russia. 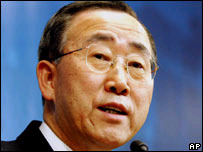 South Korea's Minister of Foreign Affairs and Trade Ban Ki-moon, who is currently the front-runner. Prince Zeid al-Hussein, Jordan's UN ambassador, who, if chosen, would be the first Muslim to head the world body. Surakiart Sathirathai, a Thai deputy prime minister until the government was ousted last week. He has the official backing of all 10 nations in Asia's regional bloc, the Association of Southeast Asian Nations (Asean). India's Shashi Tharoor, who is a career UN diplomat, having worked in the world body for nearly three decades. President Vaira Vike-Freiberga, who has been working for over a year as Kofi Annan's special envoy for United Nations reforms. What are the main challenges facing the new UN head? He or she will need to carry out the sweeping reforms that most agree are badly needed for the world body, which has been hit by accusations of waste, mismanagement and the Iraq oil-for-food scandal.